Get on the Stick! Call for B2B Pricing! 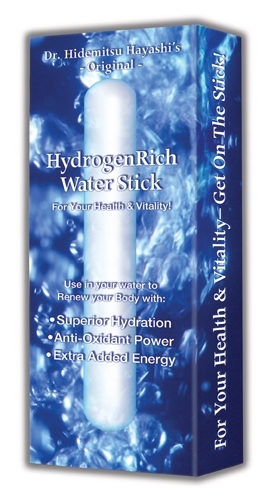 Dr. Hidemitsu Hayashi's Original HydrogenRich Water Stick makes all water taste great and turns all water into a hydrating antioxidant, fuel for the body, while aiding the body to rid organs (liver, kidneys, lungs, intestines) of toxins and ameliorate ionizing radiation. Plus you need a hydrogen-rich environment in your intestines to balance your flora- and be sure your probiotic can work most effectively! Be better hydrated, have more energy and support anti-aging. The Stick is guaranteed to make hydrogen-rich 400 gallons of water and last 6 months. Put a Stick in your personal water bottle, fill with any water you like, shake for 15 seconds and in 15 minutes your water is saturated with active hydrogen. Just refill your bottle anytime with more water and enjoy greater energy, health and wellness! You will love the taste of your water! REGARDING BOTTLES: Water bottle is not included but try www.ebottle.com and get the 1 liter swing-top fancy italian glass bottle. You can use any bottle you like, stainless steel, plastic, ceramic. If you utilize a glass bottle just don't leave your bottle in direct sunlight for a prolonged time, as a glass bottle filled with water with a fresh stick could break from the pressure of the sun heating the water and expanding the pressure. This is unusual, but with a thin glass bottle it has happened one time. With Crohn's your gut biome can be moderately to severely compromised with Candida Albicans overgrowth. The hydrogen sticks are perfect, no sugar, no additives. Just drop in your water bottle and clean via the simple instructions every month...and let the magic of molecular hydrogen do its work in your body! The hydrogen sticks, combined with other bio hacks and stress management/working to be the best version of myself/identifying and removing the emotional root of crohn's disease have helped tremendously!